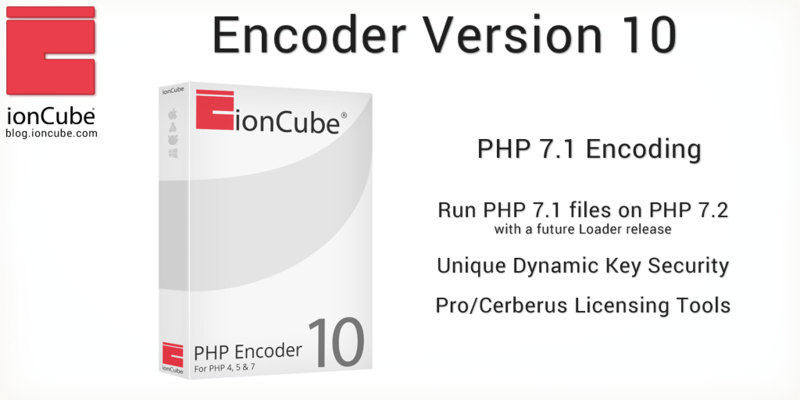 Update (December 2017): Loader version 10.1 is now available and includes support for running PHP 7.1 encoded files on PHP 7.2.
ionCube Encoder Version 10 is finally here and allows users to encode PHP 7.1 files. ionCube is the only solution which allows existing encoded files to run on future versions of PHP. With Version 10, PHP 7.1 encoded files will be able to run on PHP 7.2 without the need for re-encoding! The only requirement will be to update to a future Loader release which allows for PHP 7.2 compatibility (we’ll post about this when it is available). Here is an outline of what ionCube Encoder Version 10 has to offer. protection for your most valued code. with a future Loader release. Version 10 is available for purchase at ioncube.com and you can get a free trial here.